The position displays of the ND 500 series are suited for use on manually operated milling, drilling, boring machines and lathes with two or three axes. Due to the TTL encoder input, primarily the LS 328 and LS 628 linear encoders with a measuring step of 5 μm are used. The ND500 series are fully compatible with the Acu-Rite SENC 50 and SENC 150 linear scales. With its sturdy housing and splash-proof membrane keyboard, the ND 500 is built for the workshop. The ND 500 series shows display position values, the soft-key row and other useful information on a monochrome graphic screen. The distance-to-go display facilitates positioning. You approach the next position quickly and reliably by simply traversing to the display value zero. The functions for each application are easily activated by parameter input. Special functions are available for producing hole patterns (linear patterns and circular patterns). You can easily switch between radius and diameter display when the position display is configured for turning. 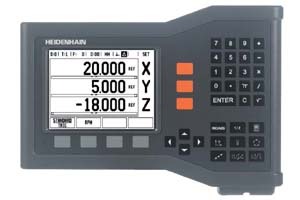 The ND523 also offers support for lathes with separate top slide: The sum display feature allows you to display the saddle and top slides together or separately. Setting datums on a lathe part is particularly easy with the freeze tool position function and subsequent retracting. A USB interface enables the display unit to output measured values and import or export parameters and tables. Angular axis: 1° to 0.0001° or 00°00'01"